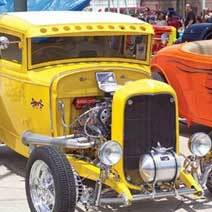 This fun event is Oklahoma’s largest gathering of pre-1989 automobiles and street rods. Enjoy a full weekend of activities including auto exhibits and shows, a street rod parade, swap meet, arts and crafts, children’s games and much more. The Southwest Street Rod Nationals features more than 1,900 specialty automobiles from all over the southwest and other areas of the United States and Canada. A large percentage of the street rods have updated drive trains, modern chassis, leather interiors, air conditioning and all the “creature comforts” of a new automobile. All cars will be on display for public viewing throughout the day. Don’t miss the automotive parade on Friday through downtown Oklahoma City. Specialty displays at the Southwest Street Rod Nationals include street rods that are owned by participants 29 years of age or under, street rods that are regularly driven by their owners, 1955 through 1957 Chevrolet automobiles, cars with chopped tops, as well as a selection of Oldsmobiles, Buicks and Pontiacs. On Sunday, cars chosen for special recognition will be on display in the Circle of Winners. In addition, there will be over 75 manufacturers of automotive specialty equipment on-hand for visitors to browse throughout the event. These commercial exhibits will be open for all three days of the event. The on-site swap meet will also be open all three days of the event and will feature vintage cars and car parts. A building devoted to arts and crafts will also be available to keep the whole family entertained during the event. The items on display will be up for purchase to participants as well as spectators..